What could be better on a beautiful sunny afternoon in Montréal than listening to music, for free, whilst reveling in the beauty of the Lachine Canal? Get your skin shined up kids because we’re heading to the South West this weekend! The Montréal Folk Festival on the Canal, running from June 15-19, launched in 2008 to celebrate and also introduce folk, roots & bluegrass music, in both French & English, to Montréal music lovers. Over the years it has grown from a 1 day event to a 5 day event attracting thousand of people. 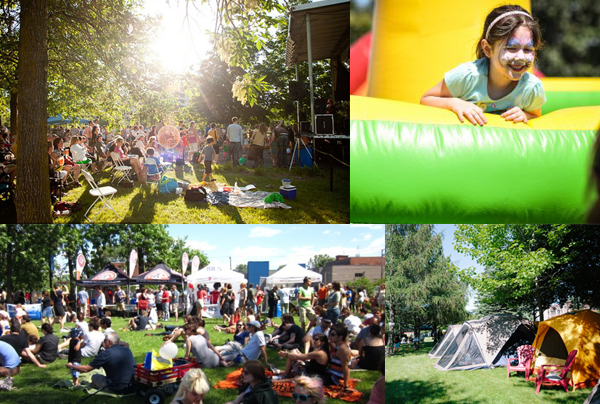 There’s a great emphasis on families as well for those of you with wee ones – it’s known as the most family friendly music fest in town. There will also be myriad local artisans on hand to sell you their wares (is just me or does that sentence sound like it’s 1892?). Mike Finnerty from CBC sums it up pretty well here: “I ​love the Folk Fest. It’s laid back, people are sprawled out on the grass, there’s good music playing. When the weather cooperates – and it will – it’s magic!”. If you so choose, you can go ahead and camp. Overnight. In downtown Montréal. That’s cool. Intimate experience with some truly awesome (and potentially “about-to-go-global” bands). This weekend, it will be hot. So, in turn, you will be hot. Like very hot. While the event is incredibly family friendly, if you have wee ones, your stay may not be that long due to the heat and exhaustion you will feel having to hawk-watch them. Plan accordingly. It’s impossible to not mention the Foresta Lumina when discussing the Parc de la Gorge de Coaticook so I will certainly touch on that below. However, I’d like to invite you to discover, explore and fall in love with a very accessible park just 2 hours outside of Montréal. The trails are a mix of dirt, natural forest floor, man made steps, and wooden boardwalks – all of which are well maintained and clean of debris. There is a lookout tower that you can clamber up to admire the view if you so choose. As well, of course, there is the most spectacular feature of the park – the longest suspended footbridge in the world. This bridge is a marvel to see, and to walk across. 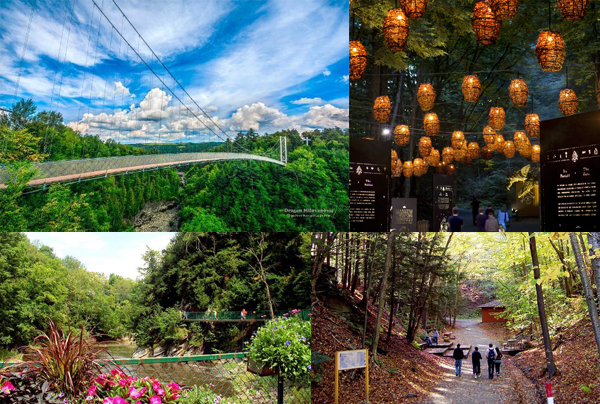 It was built more than 25 years ago by a local construction company, takes you as high as 164 feet above the raging Coaticook river below and spans 554 feet across said raging river. The slats are spaced close together so you don’t feel like Indiana Jones crossing it, and it can hold up to 80 tons, however… if you’re scared of heights, I recommend you have someone to grip onto, or into, in case it doesn’t tickle your fancy. The thing I really like about this park is that the trails bring you very close to the river, out into the surrounding forest, across a unique bridge and past various historical structures. It’s diverse, accessible for everyone and damn cool. And, for the most part, it can be as short or as long as you like! Foresta Lumina – No video or image or story can do it justice… it’s an absolute MUST SEE. Pointe Finale. The town of Coaticook is quite lovely and worth a stroll. It’s incredibly accessible – while definitely not recommended, I have hiked the paths in flip flops. If you do fill your day up with all of the things I mention here, and then get in the car to drive back home to Montréal, it can make for a long & tiring day. Obviously because the sun needs to set first, some of the start times for Foresta Lumina are late for those of you with wee ones. Depending on when you return to Montréal, the Eastern Township Autoroute can get quite clogged as you approach the 10/30 interchange around supper time. Make a serious day of it by stopping at the Microbrasserie Coaticook for beer (try the flight!) & food, then waltzing across the street to the famous Laiterie de Coaticook for some ice cream (they’ve got a cool hang-out-and-eat-your-ice-cream vibe going on). Seriously awesome combo of mouthal explosions.